Adjustable elastic torso strap with ratcheting buckle closure. Stone shield constructed with energy dispersing molded plastic panels. Strategically placed ventilation ports for maximum cooling. Soft chassis liner molded for maximum comfort. CE-certified Level 1 back protector constructed to reduce impact energy transmission. Stone shield tested and certified EN 14021:2003. Back protector tested and certified EN 1621-2:2014. Like I said, it lacks having any shoulder protection, but you almost cant tell you're even wearing it. Buckle system is nice and strong, which is a major plus. This is really comfortable and doesn’t limit movement for the trail riding I do. Definitely worth the money to have the piece of mind of the extra protection. Very comfortable while riding, it doesn't pinch or ride up. Adjustment straps make for a very custom fit. Well made and stylish. Fits very nicely. Lightweight. Great adjustment in front and back shoulder straps and side straps. Fits well with my Leatt neck brace. A little lacking in shoulder protection but still a great buy. This roost deflector does not fit with the Leatt neck braces. I know most would appreciate knowing this before making a purchase. How does this fit on a woman? BEST ANSWER: I bought a large and my mom wears it sometimes. She likes it a lot! It fits me fine. I have a slender build. 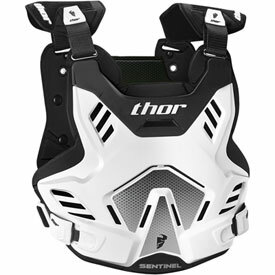 I wear it over my jersey with a Leatt neck brace. I dont know my son is the one that uses it. My 11yr old son's chest is 31. Will adult med sentimental gp be too big? Thank you for your response, I will try the youth size! BEST ANSWER: Its personal preference on fitment but they should work together. The fit and finish is going to be different on every person.